Alumni feature. A talk with Patricia Kahn: By that time, she was Associate Editor of the "IAVI Report", a publication of the International AIDS Vaccine Initiative. Before that, she worked at EMBL as a staff scientist, joined the EMBL Data Library and played a major role in establishing SWISS-PROT within EMBL. Later she worked as a European correspondent to SCIENCE magazine. Interview by Russ Hodge. From the sister sciences... Heisenberg's microscope: Scientist at EMBL Heidelberg (Ernst Stelzer and Stefan Grill) have made improvements in resolution of confocal light microscopy by linking Ernst Abbe work with uncertainty principle of Heisenberg. The EMBO corner. : The growth of EMBO has had negative impact on parking facilities. List of EMBO new activities. Role of EMBO in publishing. Science& society: EMBL has organized a panel discussion for February 10th, 2000 to talk about peer review. Written by Halldór Stefánsson. Administrative announcement: EMBL has a new employee physician. They will work closely with EMBL's Safety Officer and Management. EMBL gears up to handle heavier conference and course schedule: New events and initiatives are growing at EMBL. Everything is detailed in the Conference and Course website. EMBL Kinderhaus: photographs of the Kinderhaus inauguration. 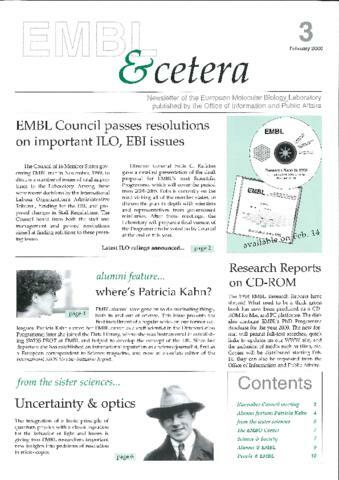 Alumni @ EMBL: During 1999 Alumni Meeting, participants decided to found a formal EMBL Alumni Association. Awards, Honors & Etcetera: Frank Gannon was awarded an Honorary Doctorate from the University of Szeged in Hungary, Matthias Hentze was awarded a Gottfried Wilhelm Leibniz Prize for 2000, Matthias Wilm won a "BioFuture" prize from the German Research Ministry, Peter Gruss was awarded the German President's "Zukunftspreis" for 1999 and Mare Kriis reitres from EMBO after 25 years.